Just kidding, it doesn't seem possible from a guy who said, "Magick is getting into communication with individuals who exist on a higher plane than ours. Mysticism is the raising of oneself to their level." However, the title works, it's a real attention grabber so in the spirit of it, I will present Aleister Crowley's researches as simply and lucidly as possible according to my own understanding. I've been asked a few times over the years: "where to start with Crowley?" I found it a difficult question because of the multi-faceted nature of his output - different people will initially respond better to different areas - so I usually suggest reading Robert Anton Wilson's overview of Crowley in Cosmic Trigger I. That was my introduction to the mage. What follows represents my own study and researches. Crowley communicates on many levels. That's why his books so richly reward rereading. While the lenses of perception get cleansed and magnified through daily practices, understanding and comprehension grows and develops through experience. More on his multiple layers of communication later. The first time I read Magick in Theory and Practice sometime in the early '80's, I turned it into a Magical Retirement, that is to say, I dropped out of all the conventional social games and spent a week concentrating on reading and digesting the book and doing some spiritual practices. I rented a room above a dive bar, The St. Regis Hotel in downtown Calgary, Alberta and fasted from food, drugs and alcohol. After morning yoga, I'd walk around downtown Calgary and find somewhere interesting outdoors to read the book. I understood very little of Magick in Theory and Practice then, but enjoyed it immensely. It would often read like mysterious, abstract prose/poetry; a definite mood descended hard to convey. Some of Rimbaud's poetry comes close. Even though most of what I read didn't make a lot of sense at the time, I did have a distinct feeling that information was reaching a deeper level. Crowley defines magic as the Science and Art of causing Change to occur in accordance with Will. 23. Magick is the Science of understanding oneself and one's conditions. It is the art of apllying that understanding in action..
24. Every WoMan has an indefeasible right to be what (s)he is. Just reading that relatively short Introduction will provide an excellent expose of Crowley's motives and intentions. After the experiment ended, I felt energized, enthused and inspired though I didn't quite know exactly why since I seemed only marginally further along with grasping how magick works and practicing it. I did have a good time with it at least. Crowley appears more interested in having the reader think for themselves rather than blindly following his instruction. Sometimes he'll deliberately mislead to keep the reader on their toes. You'll also find a great deal of humor in his writings even in the most serious subjects. Everything might not need to be taken as literally true, or maybe it is, everyone has to decide for themselves. You'll find paradoxes, riddles, hidden jokes, contradictions, blinds, dead ends, outrageous allegory, illuminated inuendo etc. etc. etc. Taken all together, Big Al's writings can seem like a vast labyrinth, successful navigating of which constitutes part of the student's training. Crowley applied the principles and practices of Science extensively toward his endeavors at consciousness transformation through magick and mysticism. He studied Chemistry in college and stayed fairly current with developments in Science throughout his life. He invokes Einstein's Theory of Relativity on the first page of the Book of Thoth, a book which summed up his occult knowledge and cosmological viewpoints through the tarot. It was written near the end of his life. Robert Anton Wilson suggested that Einstein introduced Relativity in Science, James Joyce introduced it in literature while Crowley introduced Relativity into spirituality as he sought a stronger scientific grounding in the mystical arts. Our method is science, our aim religion. Is a motto Al came up with for the O.T.O. A core textbook of Crowley's system is MAGICK, Liber ABA, Book Four. It's divided into four parts which are: Mysticism, Magick ( Elementary Theory), Magick in Theory and Practice, and Thelema: The Law. The most current edition, put out by Weiser's, is affectionately known as the blue brick for it's blue dust jacket and size. The scientific attitude shows right at the very start. "Sir James Jeans pronounced what is to me the most sensitively inclusive and accurate definition of science when he said, 'Science is the sincere and consistent attempt to set in order the facts of experience.'" Where magick and other esoteric practices such as Jungian active imagination differ from conventional science is that they acknowledge the validity of (so-called) inner experience to cause change (ie magick) in an intentional way to oneself and one's environment ( ie one'sSELF). Magick also allows for the experience of receiving non-ordinary communication. Before we go too much further it seems prudent to separate the myths and superstitions of the man, Aleister Crowley from the work and system of radical brain change transformation and development he presented. Crowley carries one of those charged names that conjures lots of superstitious nonsense in the minds of the public who have only heard of his sinister reputation. The reason for this largely undeserved reputation, and the abundance of false stories surrounding him, some of them self-perpetuated, remains a subject for another time. The man, however, definitely behaved unsaintly at times. It appears just as much of a mistake to worship him as an infallible holy guru as it is to revile him as a black magician and doer of evil. Both make the mistake of confusing some Crowley personality legend with his work. Confusing the message with the messenger. And yet who knoweth which is Crowley, and which is FRATER PERDURABO?" Frater Perdurabo (brother who will endure onto the end) was one of Aleister's magical mottos. Western culture worships personality. We expect our heroes, especially our religious figures to be god-like. Their behavior should be in accord with the ideas they espouse. While this certainly makes sense to some degree, prophets and philosophers gain more credibility when they live up to the ideas they preach, it ignores the common experience of envisioning a way of life far beyond one's current capacity. Nietzsche and his Superman, Ouspensky and his New Model of the Universe, both Crowley and Gurdjieff with their ambitions for a network of "schools" criss-crossing the globe give some examples of idealistic visions difficult to attain, at least within the immediate timeframe. Crowley once wrote something to the effect that he was the worst Thelemite because he was the first. Elsewhere, in a letter to a student, he wrote that he meticulously recorded all his experiments in a diary so that those who followed him could learn from his mistakes and failures. None of this is meant to excuse Crowley, he doesn't need an excuse or apology, the work he did on behalf of all is quite extraordinary. It's meant to show that the imp Crowley need not unduly influence the experiments his work suggests. Indeed, it's quite possible to get the gist of Crowley's vision without ever hearing about him or his jargon. I'll provide some examples a little later. Incidentally, several years ago I had a similar conversation with Bill Laswell, separating Crowley's system from his reputation, sitting in the lounge at Masterdisk mastering studio in New York waiting to master the Ramones album, Brain Drain we had just finished mixing ( mix engineers Robert Musso and Jason Corsaro hadn't arrived yet). As we were talking, I happened to notice Joey Ramone from the other end of the lounge paying attention to our conversation. He was the only Ramone present. I have no idea what, if anything, he thought about the subject. 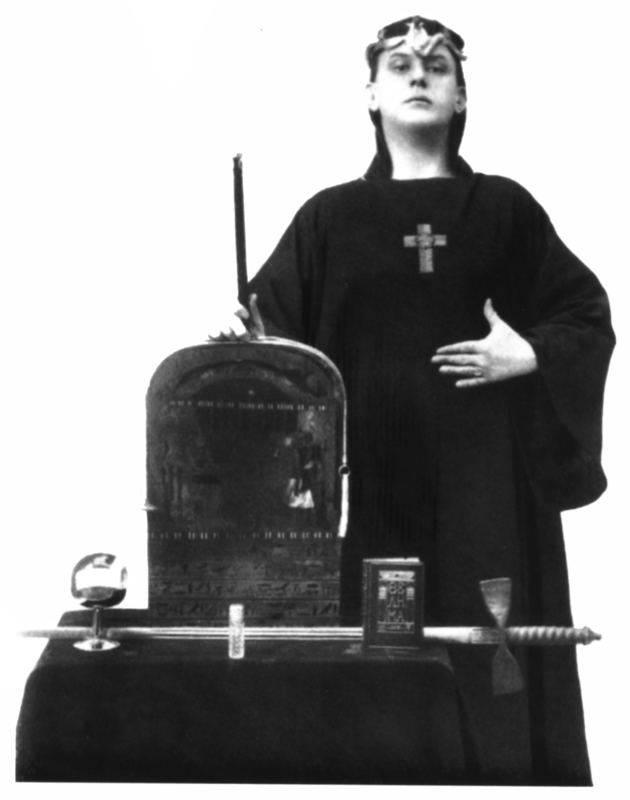 Aleister Crowley ready to rock! A root principle of Crowley's system is Will. That internal dynamic force able to deliberately plot a course of action and carry it out. Crowley called his system Thelema, the ancient Greek word for Will. He believed that every individual has an intrinsic purpose for incarnating on this planet and that their life may function optimally by discovering this purpose and carrying it out. He called this purpose True Will and declared that Higher Intelligence had given him an instruction to pass on to humanity: Do what thou wilt shall be the whole of the Law. So it seems that an initial step on the path of Thelema involves formulating or discovering one's True Will. This seems hardly a new idea, bearing close resemblance to the age-old instruction gnothi seauton - know thyself found in the ancient Egyptian temple of Luxor, the Oracle of Delphi, and used extensively by Plato in his dialogues. "She looked at her own Soul with a Telescope. and she added to the Consciousness hidden worlds within worlds." Some people have difficulty formulating a True Will but it's really not that hard to begin this process. It might help to remember that the elaboration of True Will functions more like a continuous journey than an end point. It's not necessary to come up with the ultimate purpose of your existence in order to begin formulating a True Will. One way to start - just look at what you like to do. What are your proclivities? How would you spend your life if you could do whatever you wanted if time and money were no object? E.J. Gold writes somewhere that the first question a student gets asked when applying to an esoteric school is: "Why are you here?" It can help reveal, unveil, prod or provoke True Will by asking, why am I here on this planet ... in this body... at this time. ... with this set of life circumstances? The answer to the question 'why am I here,' and thus True Will tends to get modified and refined with time and experience. For example, take someone who works in a shoe store and enjoys it. They could start by saying, 'I am here on this planet at this time to sell shoes.' Later they might consider and reflect upon the various ramifications of selling shoes. Comfortable shoes help people function better in their jobs so maybe the salesperson's True Will has something to do with providing a service that helps people do their own thing? I use this somewhat absurd example for two reasons. The first is because I asked Robert Anton Wilson at a workshop what the purpose of Evolution was? He replied that he didn't know but he hoped it had something to do with making more comfortable shoes to lecture in. The second reason is to demonstrate that True Will doesn't have to manifest as some high falutin' idealism like saving the planet or making the world safe for consumerism. It seems just as effective for apparently mundane activities. It could be a person's True Will to be a good accountant or bookkeeper, a construction worker or a school janitor. John Lennon's primary purpose in life from 1975 until 1980 was to raise a child, it seems. Earlier, it was Lennon's will, along with thousands or millions of others, to end the Vietnam war. I mention this because Lennon had a particularly creative and demonstrative approach to applying his will to end the war. That war did end as a result of anti-war pressure. This brings up a theme that we will return to and investigate later, that magick can change and/or influence events on a large scale. It seems that when Presence, Will, and Attention focus in the same direction the momentum of entire Scenario Universe is on your side. However, it's not always easy to stay aligned to True Will. Endless distractions, social pressures and other obstacles appear such as the need to 'make a living' that can temporarily impede what you really wish to do. Crowley maintained that he only got into trouble when losing sight of his True Will. "It seemed to me that I was clearly informed on how to proceed. If and when I was doing first what first needed to be done, working out the most effective strategies in pure principle, I would be able to carry on successfully. If I was not doing things in proper order or doing irrelevant things, I would be unable to carry on. If I was not getting along, I would change course and look for a way to return to smooth sailing." I use Fuller as an example to begin to demonstrate that the paradigm Crowley articulated appears common to many different disciplines and belief systems. To my knowledge, Fuller did not incorporate Crowley's writings into his world view. No evidence appears that he ever heard of him. Yet, there exist striking similarities between Fuller's approach and Crowley's system. Fuller could even be accurately called a model Thelemite, ie. an empowered individual, in my opinion. "I posited, for example, that humanity was entering an unprecedented state of comprehension of principles and mental competence adequate to the epochal inception of conscious, spontaneous, voluntary realization of magnificently essential, new-to-Earthian humans, functioning in Universe. This new stage of human evolution was no longer automatic, but a matter of conscious will." It got a bit unnerving at times as I would feel surrounded by nonhuman, interdimensional life forms that seemed much bigger and more vast in scope than anything I was familiar with. Like stepping in or having a direct view of what Carlos Castaneda calls the Nagual - an observable realm outside known reality. One day I discovered photos of some artwork on top of the rack beside the mixing desk. Looking at them, I immediately noticed their strong resemblance to a series of paintings by E. J. Gold called City in the Sky. It turned out to be more indigenous art submitted by a woman to lead singer Mandawuy Yunupingu for consideration. The congruency between this woman's art and Gold's City in the Sky paintings appeared so close that it made me wonder if visionary realms were consensual and observable by others? 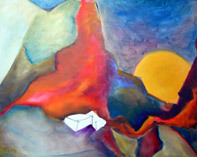 This painting by E.J. Gold has a similar feel to the City in the Sky series. As mentioned previously, a lot of resistance met this project. For Bill and I this reached its height when we were threatened with jail if we didn't explain what we were doing in Australia. Apparently another producer, someone who worked with all or most of Australia's pop groups at the time, had phoned the Immigration Authorities and filed a complaint. It was true, Mushroom Records hadn't given us proper work visas. I felt nervous, but Bill calmly told these Feds we were only rehearsing at the studio in preparation for recording them for real back in New York. They accepted our story with very few questions and appeared even more relieved than us with this legally approved reality scenario presentation. Not long after, we met the producer who had ratted us out. I was surprised by Bill's equanimity towards him. He could care less that this guy had tried to get us busted. We recorded 6 songs with Yothu Yindi. The music was created organically from the ground up. Percussion tracks were recorded one at a time against a click. Some songs had a full drum kit recorded on top of that. Bill played bass on a couple of tracks giving them a very strong rhythmic and melodic foundation. He also created the arrangements and song structures. Lyrically, the songs presented strong expressions of the Yolgnu culture with their trials and tribulations amongst the Anglo world. Gone is the Land remembers the innocence of growing up in the bush with a strong connection to the earth, and how that changed when the colonials set up shop. to a man of the mind. The pigeons call, the sharks are here. This references some of the racist propaganda claiming that the native Australians weren't there when the Europeans first arrived. I don't know how this wacky theory attempts to explain their presence. Though this might look like standard socially relevant protest music, it should be remembered (from the previous post) that lead singer Mandawuy Yunupingu was bearing the brunt and right in the heat of this kind of nonsense from having been named Man of the Year. Right wing talk radio jocks were busy inciting public hatred and organizing demonstrations against him. In that context, these lyrics become extremely confrontational. One piece was a completely traditional Yolgnu song with instrumentation consisting only of didgeridoo, clapstick and vocals. Many but not all of the lyrics were in English. It seems to be about two mysterious female travelers bringing great wisdom to the land. Another instrumental piece became a hybrid fusion of traditional instrumentation seamlessly blending with the trademark Laswell ambient dub composing style. The recording studio as one musical instrument in the production. One of the most intense sessions for me, of this or of any other project, was the didjeridoo overdubs. The Yolgnu play a specific type of didjeridoo called a yidaki particular to their tribe. I got to this session a little early. A large, muscular Yolgnu was setting up the space where he was going to play. Two others were standing very still to his right. I felt an instant silent rapport with the two standing still. There seemed no need to introduce myself, make conversation, or go into any of the other social routines that distract from pure being contact. I felt totally comfortable with these complete strangers. Then I saw a smallish ball of shining, radiant light about the size of a grapefruit just behind and to the right of each of the two Yolgnus standing still. It's the one and only time I've ever seen anything like that and it didn't last that long. The yidaki player, Bunimbur Marika still rates as the best dijeridoo player I've ever heard. The strength and focus of his breath resonated powerfully into the rich, rolling timbre of the instrument. The deep low frequencies pushed the air just as massively as Sly Dunbar, Jah Wobble or Bill Laswell do when playing dub/reggae style bass though a large P.A. At one point we ran his yidaki through a subharmonic synthesizer. The effect produced ridiculously huge low end. We ended up not using it though, After our run-in with the Immigration Authorities, we became a little concerned with causing neighborhood seismic worries or of distracting the flight patterns of jets flying by overhead. Marika wore a black leather Harley Davidson motorcycle jacket the whole time he recorded. Someone told me he was the king. I took it to mean king of yidaki players not king of the Yolgnu. The final resistance to our participation with Yothu Yindi came from the label's fear based perception that the songs didn't sound commercial enough for the marketplace. We finished by doing some good rough mixes, mixes that I still listen to this day because I like the songs and it brings back memories. The label gave the tracks we had done to another producer who added generic synth pads and drum machine samples. It gave the tracks a harder, brighter, more machine-like sound. Robbed them of their soul, in my biased opinion. Biased because I know and experienced the power of the soul those songs at one point possessed. Diluting our contribution didn't bother me in the least. I wasn't concerned about or lusting for any particular result. The experience proved quite extraordinarily life-changing. I was very grateful just to be there. I felt energized, charged and to be perceiving things in new ways. Naturally very high seems another way to put it. The fallout of close contact with an ancient culture for a set period of time. Walking to the back of the line to board the plane at the airport I happened to notice an exceptionally beautiful young lady standing in line; an unreal, contemporary, fairy tale beauty like Snow White meets Princess Lea. As fate would have it, we were seated in the same aisle of the jet with an empty seat in between. I don't usually strike up conversations with strangers but she started spontaneously opening up to me early in the flight. She said her name was Emma and that she taught physical fitness in Greece where she lived part of the time when not in England. I don't remember what she was doing in Australia but she was on her way to Iceland. Her father owned an island in Zanzibar, and she had spent time in Africa growing up. Emma complained and lamented to me that most people only related to her physical appearance, thus her relationships felt superficial. A classic poor little rich girl story. It seemed obvious to me that she was looking for being contact. I don't recall how this connected with her concerns but do remember responding by talking about John Lilly, floating ( in a floatation tank), dolphins, and the Law of Three. Ironically (to me), the movie they screened was The Bodyguard with Kevin Costner and Whitney Houston. It's about a former Secret Service agent hired to guard a pop star. Surprisingly, I enjoyed it. Whitney Houston's acting was much better than expected and even Kevin Costner was bearable. Emma didn't like the film, she thought it was very cliché. Whitney Houston got her professional start in the entertainment industry recording with Bill Laswell at age 16. After we went through customs in LA, I never heard from or saw Emma again. Some people you just work with for a brief but intense period of time before moving on. About a week later I was getting on a flight to Europe with John Zorn and Bill to mix a Painkiller show. I noticed that TIME magazine had an actress on its cover whose first name, Emma, was printed in large stylish letters. I tried telling Zorn about this coincidence but only succeeded in confusing him. Qabalistically, I connected the name Emma with the Hebrew letter mem which corresponds with The Hanged Man of the tarot. In some systems, The Hanged Man represents the first stage beyond ordinary personality, the first stage into the Deep Self. Mem is also the letter that corresponds with the element Water. The whole experience with Emma occurred in flight over the Pacific ocean. This strange upscaling of perceiving and functioning that I took home from the Yothu Yindi encounter lasted a good 3 or 4 months. I'm not sure that it ever went away or if I just got used to it.